Karl Koller was born on April 16th 1919, the youngest out of ten in Kitzbühel. As a boy he was already fascinated by skiing, the sport that influenced his career for a lifetime, whether as a ski racer, as the head of the ski school in Kitzbühel or as the chairman of the Austrian Skiing Association. Karl Koller dedicated his life with all his heart and soul “The two planks that mean the world”. 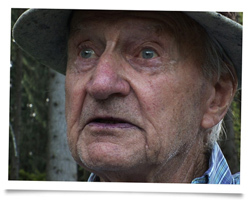 Today, at the age of 91 Karl Koller lives with his wife Ida in Jochberg in Tirol. During the winter they both love to go wild cross-country skiing every day.